Arcam Solo Music review | What Hi-Fi? Sometimes it’s easier to have everything in one package – all-inclusive holidays, or microwave meals, for example. But when it comes to hi-fi, there are benefits of having a system of separates over a one-box solution, mostly in terms of absolute audio quality and future upgrade opportunities. However, for those put off by convoluted system-matching, or who don’t have room to house multiple boxes and trailing wires, single-box solutions certainly have their place. There are budget micro systems, like the Award-winning Denon D-M40DAB, and high-end all-in-ones, such as the Cyrus Lyric 09, but anyone looking for a premium just-add-speakers system to be at the centre of their hi-fi and home cinema entertainment should take a look at the Arcam Solo Music. Having been around for over a decade, Arcam’s Solo range initially garnered success with compact systems such as the original Solo and Movie 5.1, which both picked up five-star reviews and What Hi-Fi? Awards, before evolving to include a networked system and more recently a soundbar. 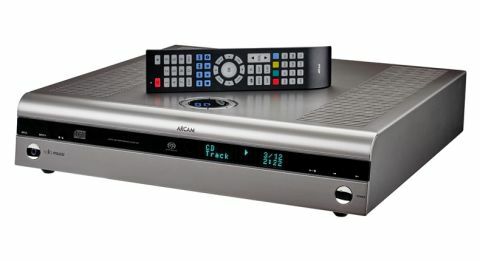 Here we have the third generation of the Solo Music, which is the more audio-centric model of the two new Arcam Solo systems; the (also third-gen) Solo Movie matches it for build and specs but adds extra output channels, Blu-ray playback, DTS and Dolby decoding and 4K video upscaling – and asks an extra £500 for those privileges. But even stripped of its sibling’s video functionality, the Solo Music has a Swiss-Army knife-like array of functions. As well as being a CD/SACD-playing, network-streaming source in itself, and having a DAB/DAB+/FM tuner onboard, the Solo has a cluster of digital and analogue connections, including four HDMI inputs, and single optical, coaxial, USB, phono and 3.5mm inputs. It can also cater for the likes of Blu-ray players, game consoles, satellite boxes and audio streamers. Connect it to a TV or projector with an HDMI output and the Arcam Solo Music can sit at the centre of a home cinema system too – essentially acting as the middleman between your video source and screen, much like a soundbar without the built-in speakers. A 3.5mm headphone output on the front panel means you don’t have to turn Mad Max: Fury Road down to a whisper when the kids have gone to bed. DLNA functionality also means that when the Solo Music is connected to your network – via Ethernet port, or wi-fi via way of a supplied antennae – it can pluck songs, including FLAC and WAV files up to 24-bit/192kHz, stored on any connected NAS drive or laptop. Attaching the second antennae to the Arcam’s rear grants it aptX Bluetooth too. There’s an app for controlling the Arcam and accessing and browsing networked libraries. The MusicLife app (available for iOS only) identifies our Solo Music sample right away, sniffs out our NAS drives without prompting and proves handy for scrolling our lengthy catalogue. The interface is clean and intuitive, but the Solo is sometimes slow to respond to commands – there’s often a few seconds delay between song selections and playback. For general playback controls, we prefer using the backlit remote, which is intuitively laid-out and practically packed with buttons to cover all bases. If VHS was brought back from the dead in the same way as vinyl, the Solo Music is how we imagine a modern-day VCR would look, largely in part to its chunky casework and retro styling. But that’s no criticism; it’s handsome and looks classy, which is as much down to the sleek finish as is it is flushed playback buttons on the fascia and wheel volume dial up top. It’s worth mentioning some of the Solo Music’s insides too. It shares components with Arcam’s home cinema and hi-fi separates, including 160W of Class G amplification – found at the high-end of Arcam’s FMJ integrated amplifier range. This configuration prides itself on power efficiency by implementing multiple power supplies so that when it receives a signal that goes beyond the capability of the first power supply, a secondary one is on standby to kick in. More power supplies, more noise? Not here. After the disc tray closes on The Flaming Lips and Stardeath and White Dwarfs’ The Dark Side of the Moon album with a satisfying click, the Solo runs so quietly that it won’t distract even if you find yourself sitting close to it. Like many Arcam products before it, the Solo Music delivers an instantly likeable sound that you can settle in to for the evening: powerful, punchy and smooth, with sonic must-haves like clarity, balance and detail also in check. With no part of the frequency range tipping the tonal scales, the muscular bassline, fuzzy electrics and sprawling synthesizers that drive Any Colour You Like have just as much clarity as the ever-present cymbals that cut through them. While it’s not an easy track to spell out, the Arcam has the space and precision to communicate the tempestuous production, splitting even the most saturated instrumental parts into distinct layers. Its big, broad soundfield captures the epic scope of the The Lord of the Rings: The Fellowship of the Ring theme song, spreading the underlying choir far and wide, taking the roof off woodwinds and flexing its muscles in the string ensemble, which has real welly behind it during the climatic moments. While it may overlook nitty-gritty subtleties, it communicates the dynamic outline of a track confidently. We switch to Anthony and the Johnson’s Crying Light album for some vocal scrutiny. The Arcam rides each rise and dip of Hegarty’s seesawing delivery, while communicating all of the necessary soul. It’s solid and focused, and in the track Aeon, explodes out from beneath the accompanying harp and guitar. Daft Punk’s Get Lucky is a track that often reveals a lazy-sounding product, but it won’t catch out the Solo Music, which affords it all the intended energy and radiance. As expected, the presentation is a little rougher around the edges through Bluetooth, losing some refinement and detail at higher volumes. Still, there’s enough clarity and balance to keep with it, even when streaming from Spotify. We hook-up our streamer to the Arcam’s line-level analogue input for a hi-res version of Fleetwood Mac’s The Chain (24bit/96kHz), and the Solo steps up. There’s real force to the thumping bass, and deep extension when the chorus’ meatier bass line comes in. It handles the rhythmic drum patterns, and dynamically drum-rolls the building electric guitar solo. Fancy a spot of radio? We listen to FM and DAB, with headphones and without, and are more than satisfied with the clarity and detail on offer. It proves as impressive with presenters' voices on Absolute Radio as it is sensitive to the musical inflections of Michael Kiwanuka on BBC Radio 6 Music. We don’t need to scribe a different character reference for the headphone output, which has plenty of weight and punch, and apt transparency, as we listen through our Grado SR325es. In 2005, we described the original Solo Music as ‘something of a benchmark system at this price level’, so it’s quite remarkable that the same is pretty much true of the latest version. A well-made, well-featured and solid-sounding product, the Arcam Solo Music is indeed a complete one-box stereo system.